Do you catch yourself murmuring “White Christmas” song time and again? And a desire to re-watch “Home Alone” is getting stronger with every passing second? It’s a clear sign that a time for ho, ho, ho is coming soon with its sparkling decorations, candy canes, mistletoe, and fir trees! Christmas is one of the most celebrated annual holidays bringing along lots of traditions deep-rooted in the ancient culture. No wonder that so many of us get ready for this special day well in advance as well as we, the Unicheck free plagiarism checker team, do. For many of us Santa-Google becomes an absolutely essential assistant: You enter requests related to Christmas dishes, party games, gifts, romantic films to watch, etc. But for this opportunity, you would never know that evergreen holiday trees were worshipped by a lot of pagans, mistletoes were used for winter festivities by the Druids long before Christ was born, or that famous red-leaved plants poinsettias originally come from Mexico. Have you ever resorted to the Internet for Christmas must-do lists? Obviously, this thing can stand you in good stead to timely cope with holiday chores. Aside from stocking stuffers and holiday menus, you need to take care of leisure time activities too. 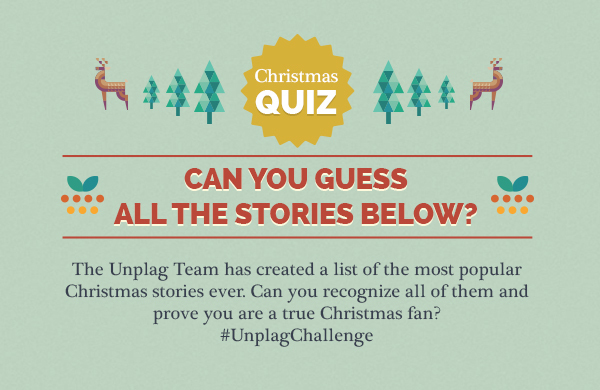 So, why not add a quiz with the most popular Christmas stories to your list? Unicheck created the one especially for you! It’s high time to remember the admired plots and characters and find out if you can guess all of them. Share your score with us! Scholarship Essay: How does the Digital Age Influence Plagiarism and Cheating?